Only 261 players showed for the WPT’s World Poker Challenge, indicating that many of the world’s finest were not up for the challenge (nyuck, nyuck). As has been a trend recently, and by "recently" we mean the last six or so years, Phil Ivey finds himself atop the leaderboard after Day 1 play, stacked at 179,900. 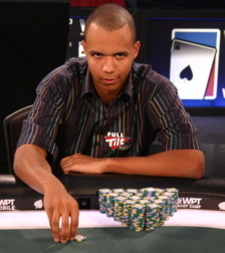 Ivey won last month’s LA Poker Classic. He’s closely followed by Eli Elezra with 178,800. In third overall is Jordan Rich, a ginger, with 131,300. While a fixture on the circuit since 2004, Rich exploded like a red fire-ball on the scene last December with a fifth place finish at the WPT Bellagio Five-Diamond Classic. Since then, Rich, a ginger, has racked up almost another $100k in tournament earnings, including two first place finishes in prelim LAPC events. Other big stacks remaining include but are certainly not limited to Hasan Habib (110,300), Bill Edler (93,300), Erik Seidel (88,100), Erick Lindgren (81,900), Peter "Nordberg" Feldman (60,300), and Michael "The Grinder" Mizrachi (52,800). Other big-name-not-so-big-stacks remaining include David "The Dragon" Pham* (50,200), this guy who looks like he just escaped from prison (39,300), Ted Forrest (36,900), and our perennial pick to win it, Huck Seed (33,500). Get full chip counts from the WPT here and video updates here. Also, quick happy birthday to FOWCP Joe Sebok. Watch the below vid, btw.